About 50 groups from the South-East and South-South on Saturday in Enugu State demanded the immediate and unconditional release of the leader of the Indigenous People of Biafra, Nnamdi Kanu. The groups, comprising Christian bodies, town unions, women and youth organisations, students and traders associations, threatened to join IPOB if Kanu was not released immediately. They also demanded the restructuring of the country along regional blocs. In a two-point communiqué issued after the meeting, the groups urged the Federal Government to obey a December 2015 court ruling which ordered Kanu’s release. The communiqué, which was signed by leaders of the groups, including Mrs. Maria Okwor of the Igbo Women Assembly, Bishop Michael Ibeneme of the South-East Christian Network, and Eliot Uko of the Igbo Youth Movement, read in part, “We are giving notice to the world, that if the unjust, provocative and divisive detention of Nnamdi Kanu is not specially looked into for the sake of peace, equity and justice, we may no longer restrain our members, affiliates, friends and sisters groups that have indicated their resolve to join IPOB in solidarity with the persecution and unjust detention of their leader. According to the groups, the current structure of the country, which was imposed by the military, was “unworkable”, noting that it has undermined development of various regions of the country. “A six-region structure remains the only formula to salvage and rebuild Nigeria. Those opposed to a six-region structure are only working towards the eventual disintegration of the country. All political, economic and social indicators pointed to a self-evident truth that only an early reversal to six regional structures will save the country now,” the groups stated. 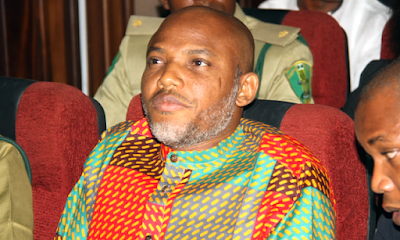 On his part, Ibeneme urged Buhari to “reduce the anger and bitterness in the land” by releasing Kanu. “Those advising otherwise do not wish him well,” he said. Similarly, President of Igbo Students’ Union, Chimezie Ubani, claimed that Igbo students in tertiary institutions in the South-East had resolved to join IPOB to protest Kanu’s detention.